Happy Friday. I had a small revelation about myself today while I was driving alone in my car. Well, it wasn’t that dramatic. It was more like, I was thinking about random, unimportant things. Then, I suddenly started to realize some quirky things that I tend to do without consciously acknowledging them. 1. Unlike my husband, who gets incredibly excited to watch new movies in the theater upon their fresh release, I don’t really get hyped up to watch new movies. It’s hard to get me excited to watch a new movie in theaters. I tend to gravitate more towards older movies. I don’t only mean classics from the 50s & 60s… I’m more likely talking about movies that are already released on DVD. If I find a movie that I like, I can watch that movie over & over (5, 6, 7+ times) without getting bored or tired of it. I am not going to say which is my favorite movie. I just can’t say. However, I can say this for example, I have a watched Ratatouille about 10 times already…probably more, & I am not sick of it. I don’t understand why I get this way over movies, but I just like what I like. 2. I tend to be a compartmental eater. Whenever I’m eating, I eat my food in sections. If I have rice or other starch items on my plate, I don’t like having other foods with sauce touching it. I like to eat the side items first, then the main item, & save the starchy items for last. 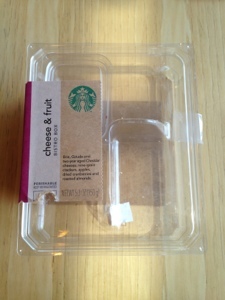 When I visit Starbucks, I tend to only get their cheese & fruit box if I order food. The box contains: a packet of multi-grain crackers (6 pieces), green apple slices, a small container of dried cranberries & almonds, & a selection of 3 cheeses (aged Cheddar, Gouda & Brie). I will first eat the apple slices, then the container of cranberries & almonds. Even with the berries & almonds, I will eat them separately. I will eat all the cranberries before I eat all the almonds. Next, I will eat the cheeses separately. First I will eat the Cheddar, then the Gouda. Then, I will eat the crackers. Hwre’s where I kind of loosen my compulsive reigns a bit. I usually save the piece of Brie for last, but sometimes I will deviate & eat it with the crackers. (Oh! So scandalous! Well, that’s pretty much it. I recently told my husband about these 2 quirky things/habits of mine. He thinks I’m a bit odd, but he’s OK with it & so am I. I hope it’s sunny & hot wherever you are today. It’s nice & toasty where I am. Let’s enjoy. Cheers!